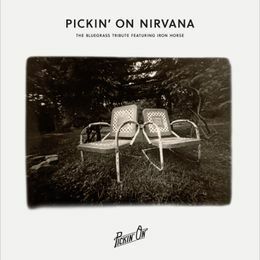 CMH RECORDS is celebrating the release of Pickin’ On Nirvana: The Bluegrass Tribute Featuring Iron Horse, the latest installment of their series featuring bluegrass interpretations of influential artists. A special vinyl Record Store Day first release drops this Saturday, April 22 with a digital release to follow April 28. To commemorate the special vinyl release this Saturday, Iron Horse will perform live from Oz Music in Tuscaloosa, AL with the entire set being streamed live on CMH Records’ Facebook page at 10am PT/12pm CT/1pm ET. Pickin’ On Nirvana: The Bluegrass Tribute sees songs by the seminal alternative rockers stripped down to bare bones roots music. Alabama-based quartet Iron Horse brings their traditional instrumentation and harmonious vocals to bear while tackling Kurt Cobain’s wildly influential fusion of melody and discordance. It all adds up to a collection of renditions that are unlike anything ever heard by fans of bluegrass and Nirvana. Iron Horse’s rendition of “Night on the Sun” from Pickin’ On’s tribute to Modest Mouse was featured prominently in HBO’s True Blood; watch here. This past December 2016, their tribute to Metallica, Fade to Bluegrass: A Bluegrass Tribute to Metallica reached #13 on the Billboard Top Bluegrass Albums chart. Check out Iron Horse performing “Enter Sandman” here. CMH Records remains dedicated to presenting the finest in bluegrass and roots music, through re-issues of classic material by the greats and stellar recordings from new voices. Other artists that have been given the Pickin’ On treatment include Grateful Dead, Metallica, Bob Dylan, the Allman Brothers Band, Coldplay, The Black Keys, Jack White, Modest Mouse, The Killers and many more. Born out of a love of rock music and for the virtuosity of bluegrass musicians, the Pickin’ On Series features the best in bluegrass, paying tribute to the biggest and brightest artists in rock and pop. Though it started modestly in 1993 with the release of Pickin’ On the Movies, tributes to The Beatles and Eagles soon followed and by 1997 the Pickin’ On Series was on fire. The Pickin’ On Series continues to thrive with one hand in traditional bluegrass and the other in popular music, ready for the next chance to create innovative bluegrass music.